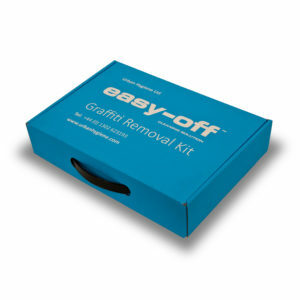 easy-off is a safe graffiti remover suitable for all situations. Capable of shifting permanent marker pen, spray paint and a wide range of other graffiti media easy-off makes a great catch all cleaning chemical for your graffiti removal kit. Simply spray, leave to work for 3-5 minutes and then wipe, wash or pressure wash the graffiti away. easy-off works best on hard and non-porous surfaces and can be used in conjunction with Graffiti Shadow Remover should any graffiti ghosting be left behind. easy-off makes short work of glue and sticker residue meaning it’s perfect for removing Fly-Posters and Bill Stickers on lampposts and street furniture. Contact time is a little bit longer (around 5-8 minutes) but once softened the offending sticker or poster should peel away easily. easy-off safe graffiti remover was specifically designed to work harmoniously with easy-on anti-graffiti coating. Graffiti removal using easy-off can’t shorten the 20-year life expectancy of easy-on and as such, all graffiti including permanent marker pen, graffiti spray paint, Tippex, nail varnish and crayon can be instantly, easily and repeatedly removed to reveal a clean graffiti free wall time and time again.